If it comes down to a decision between Ohio State and Alabama for the final College Football Playoff spot, who will win? There is already a winner in that debate. That winner is the College Football Playoff. You can’t buy the kind of attention the College Football Playoff has gotten from having the most discussed topic about the announcement on Sunday of the four teams who will be in the playoff be which of the two biggest heavyweights in the college game should get in. It’s the football equivalent of the Red Sox against the Yankees. It’s like having Jay-Z and a Kardashian feuding. It’s like Golden State and the Cavaliers having 50 or 60 of their games on national TV and the Indiana Pacers playing four or five games in front of a national audience. Whoever gets the fourth playoff spot, an Ohio State-Alabama debate generates much more heat than a Georgia-Auburn or TCU-USC discussion would. More people are going to watch ESPN to hear Kirk Herbstreit, Joey Galloway and some guy named Booger debate the merits of Alabama and Ohio State than they would if the two teams fighting for the last spot were from less legendary football programs. The same goes for people reading about the playoff on websites or in the sports sections of newspapers. 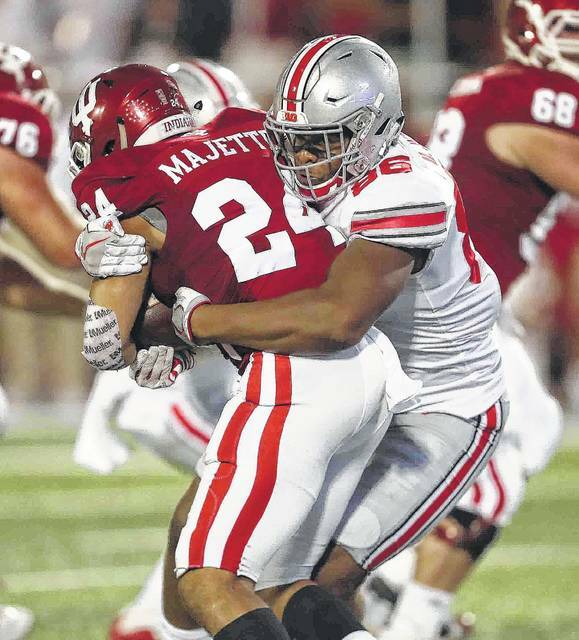 Ohio State and Alabama deliver readers and page views. Undefeated Wisconsin moving up to No. 4 this week in the next-to-last playoff rankings ordinarily would be a big story. But it doesn’t have the juice of Ohio State-Alabama. If Ohio State beats Wisconsin in the Big Ten championship game and gets into the final four, the College Football Playoff will have gotten a lot of mileage out of the Buckeyes. If the Buckeyes beat the Badgers but Alabama gets the nod, Ohio State still helped keep the playoff in the conversation. The same would be true if neither the Buckeyes or Crimson Tide get into the playoff, probably the most unlikely outcome of all. Some Ohio State fans are already constructing conspiracy theories that the College Football Playoff selection committee is stacking the deck to get Alabama into the final four. Some Alabama fans think there is a conspiracy to get the two-loss Buckeyes into the playoff ahead of their one-loss team. If Wisconsin beats Ohio State, everything gets a lot simpler. The Badgers would be 13-0 and Big Ten champion and almost certainly in the playoff. The knock on them is their schedule is less than imposing, which is also one of the biggest negatives on Alabama’s resume. The best thing Ohio State could do is beat Wisconsin badly, but maybe not as badly as when it bludgeoned the Badgers 59-0 in the 2014 Big Ten Championship game. Something like a 35-17 win might be the sweet spot for Ohio State. A closer score might not be enough to cancel out OSU’s 55-24 embarrassment at Iowa. A blowout might provide proof for the idea that Wisconsin’s record was built on a schedule filled with cream-filled pastries and make the selection committee question how impressive Ohio State’s win was.